School’s almost out for summer, and teachers and parents everywhere are already talking about how to prevent children from experiencing the dreaded “summer slide.” Here are some fun ways to keep your child’s reading levels up during the summer months. A summer reading program is a fantastic way to keep kids excited about reading over the summer. Poudre River Libraries’ 2013 program, “Dig Into Reading,” starts on June 1 and ends on August 4, and is open to all ages – even babies. Everyone is challenged to read for 10 hours, and after those hours are logged and you keep reading, Poudre River Libraries will donate $1 to Wildlands Restoration Volunteers for each additional hour read. Participants who log 10 reading hours will also be entered into weekly drawings for prizes, and there are fun events for each age group happening throughout the summer. In 2012, Poudre River Libraries’ Summer Reading Program had over 11,000 participants, and the odds are looking good for another great summer of reading! For schedules and more information, visit www.poudrelibraries.org. Starting your own kids’ book club can be a perfect opportunity to make reading fun: kids can invite their friends, meet once a month, and talk about the book they just read. Poudre River Libraries makes it easy to start a book club, with pre-made kits for many popular children’s and young adult books. The kits include 10 books in a container with questions, book reviews, author information, and a sign-out sheet. Click here to see which books are available as book club kits. A great way to get kids interested in reading is for them to read a book (or comic) that has been adapted into a movie. The whole family can read the book—such as Harry Potter, Where the Wild Things Are, The Fantastic Mr. Fox, etc.—and then rent the movie and have a family movie night to celebrate. Setting a goal early on, and keeping track of the progress toward that goal, can be a wonderful motivation tool to keep kids reading. 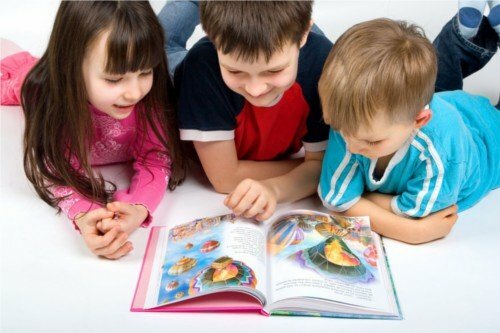 First, come up with a list of books that your child would like to read. (Poudre River Libraries has a helpful tool for this that suggests books based on what books your child already likes. Click here to check it out.) When you have your list, draw and decorate a fun chart together. Then put up on the wall and list the books on it. There can be small prizes for completing each book, or a big prize at the end of the list—you decide! Check out the Libraries Pinterest Board for more craft ideas. It’s important to remember that any kind of reading is good reading. Encourage your kids to read something every day: in the morning, hand them the comics section of the newspaper. In the daytime, find an activity that includes reading, such as writing down recipes from a cooking show and making them together. In the evening, have your child read you a few pages of the book that he or she is currently reading. And don’t forget to model being a reader yourself… even adults can join the Summer Reading Program and win prizes! Hello, and welcome to the Poudre River Public Library District’s blog! My name is Kristen and I am the Digital Literacy Librarian here at the Poudre River Public Library District. My job is to help people learn how to use new technologies appropriately and effectively, whether it is job related or simply for fun. It certainly keeps me busy! There is so much new technology to learn and then to teach, it can be a bit like herding cats! Speaking of cats, my 2 are not sure about our newest family member – a small black and tan puppy named Chaco. We love him, though, and as with any baby, what does a proud mama do? Take videos of course! But then what? In the past, I have been known to let videos and pictures languish on the camera for weeks, even months, and then MAYBE post them to Facebook or send them to family members. This time, however, I decided to make a movie. With only an iPad. Immediately. How did I accomplish this, never having used iMovie before? Easily, and in about an hour! The first step was to download iMovie onto the iPad (cost $4.99). Then, I started taking videos within the iMovie app with a simple press of the record button on the screen. (I could easily import other videos I had taken as well.) Once I shot the videos, I started editing, again within the iMovie app. I was able to edit the video into shorter clips, change the order of the clips, make cuts, add music, captions, beginning and ending titles and a theme, and then upload the finished product to Facebook without ever having to leave the iPad. Amazing! If all of this sounds too difficult (or too expensive), don’t worry. We will soon have all of the equipment and apps available at the library for you to learn how to create your own short video. Make videos for work or school, post them to YouTube or Facebook, and watch what happens when you create your own fun! Take a look at my short video created on an iPad in about an hour! What’s the “A” All About? Many times I have had visiting friends and family ask me what that giant “A” up on the hill is all about. Of course I am happy to divulge the tale of the white symbol above our city, but I also wonder how many of our locals may not really know what that “A” is all about. The “A” comes to us courtesy of Colorado State University as one of the longest standing traditions at the school. But why would CSU place an “A” on the hill; CSU was founded in 1870 as the Colorado Agricultural College. The “A” stands for the Aggies; the original team name/mascot for the college. The “A” was first created on December 4, 1923. In just 6 hours of construction a CSU tradition was born. “The following year, on Sept. 20, students lengthened and widened the “A” to its present size of 450 feet high and 210 feet across.” Each year the “A” is maintained by freshman football players and several other campus organizations. They hike up to it with buckets of white paint, truth be told- getting themselves whitewashed also.